At a Board of Education meeting tomorrow, surfing is set to gain official status as a high school sport for the first time in Hawaii. 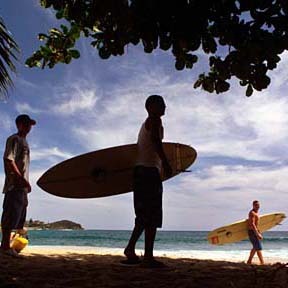 Above, Skylar Holt, left, Eddie Maldonado III and Nalu Foriseth checked out the waves yesterday at Makaha Beach. Maldonado said he had tried to start a surfing club at Waianae High School but was unsuccessful.